Game 5 of the Rangers-Blue Jays ALDS was thrown into chaos by a controversial play in the seventh inning. 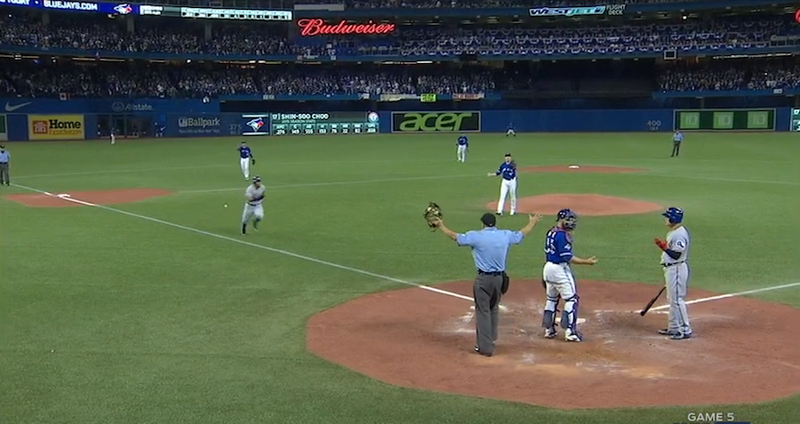 You can see Blue Jays catcher Russell Martin attempting to throw the ball back to his pitcher in the GIF above. The ball hits Rangers outfielder Shin-Soo Choo’s bat, who was going through his normal routine in the batter’s box. Seeing the ball dribble away, Rangers second baseman Rougned Odor sprinted in from third to score. Home plate umpire Dale Scott put his hands up as if to call time before Odor reached the plate, and the play was called dead. But the officiating crew convened for a conference, and determined that the ball was in fact live, so the Rangers took a 3-2 lead. The play then went to an official replay review, and the umpires confirmed that the run had scored. Blue Jays manager John Gibbons asked for the rest of the game to be played under protest, and then a child got hit with a beer can thrown from the upper deck. We get that you’re mad at the call, but Jesus, people, there are kids down there!